Vijay (N.T.Rama Rao) is very fond of his sister Laxmi (Sujatha).He wants his sister to marry a good and rich guy.So he goes to Padma (Jayasudha)'s house with marriage proposal for his sister to Padma's brother.But Laxmi loves Murali (Murali Mohan).So Vijay performs their marriage.But Murali's mother is very cruel.She doesn't treat Laxmi well.What will Vijay do in this situation.? Watch out in the movie Mahapurushudu. Maha Purushudu Vijay (N.T.Rama Rao) is very fond of his sister Laxmi (Sujatha).He wants his sister to marry a good and rich guy.So he goes to Padma (Jayasudha)'s house with marriage proposal for his sister to Padma's brother.But Laxmi loves Murali (Murali Mohan).So Vijay performs their marriage.But Murali's mother is very cruel.She doesn't treat Laxmi well.What will Vijay do in this situation.? 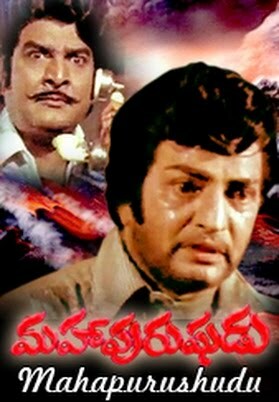 Watch out in the movie Mahapurushudu. .